Well, we are back. Our evacuation lasted all of eight days, and thanks for that. We came back to an empty house. No food, no anything. Except, that the house is here and it doesn’t need repairs, and no flood insurance claim needs to be made. Looks like we won’t get to test the FEMA waters this time around. We even thought of one of those little white trailers as a potential long-term place to stay. But no, not this time. Hopefully not ever. There was a snake in one of my shrimp traps when we got back, a water snake, no problem. It was very anxious to get out of the trap but I want to take a few pictures of it so it lives on with the shrimp and small fish as neighbors until tomorrow. 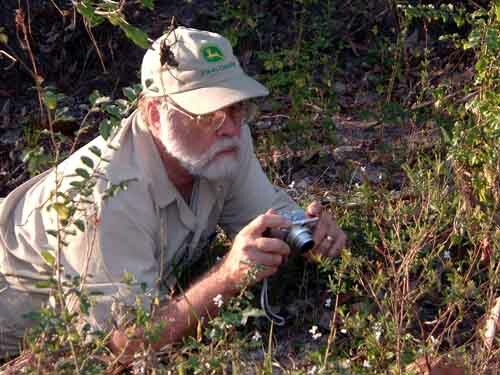 Come to think of it, that’s a pretty good place for a fish-eating snake to live. The cats are back. They boarded with friends while we were gone. More generous people! 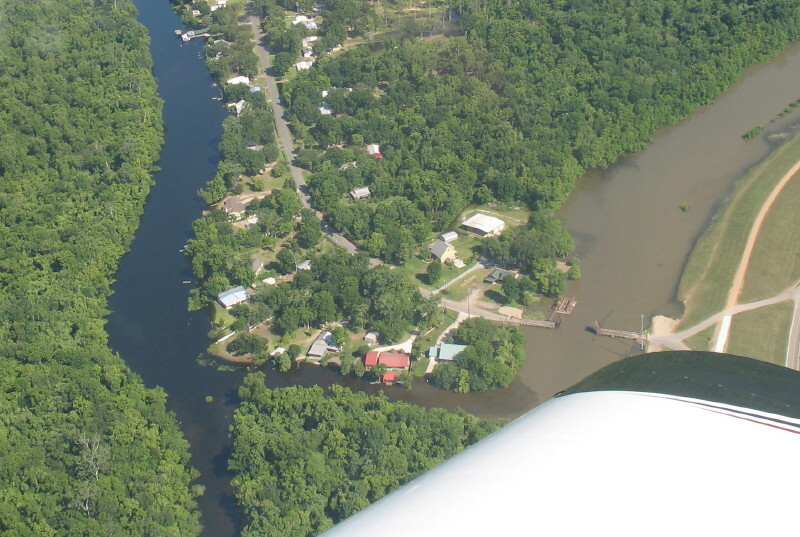 A call from a friend asked if I would like to fly over Butte La Rose and see what the water looked like from the air. Yes, I surely would. His name is Ken (no last names on the blog unless cleared first, my rule) and he has a two-seater that he built himself – literally. Nearl y every, bolt, screw and instrument was done by him, from a kit. He has been building it for several years and recently finished. A bit disconcerting was the note on the dashboard from the FAA. It said passengers should be aware that the plane you were in was built by an amateur and you were basically on your own. But it went up, and it went down, and it did everything a plane is supposed to do, I think. It was a fun trip! 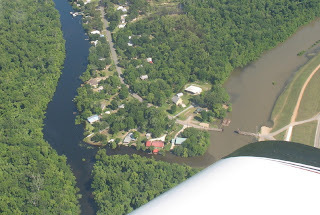 What did we see flying over the Atchafalaya River and the levee following it, and the Butte La Rose area? Well, nothing heavily dramatic. There simply is no evidence of the serious consequences you see on the news reporting from the cities along the Mississippi. 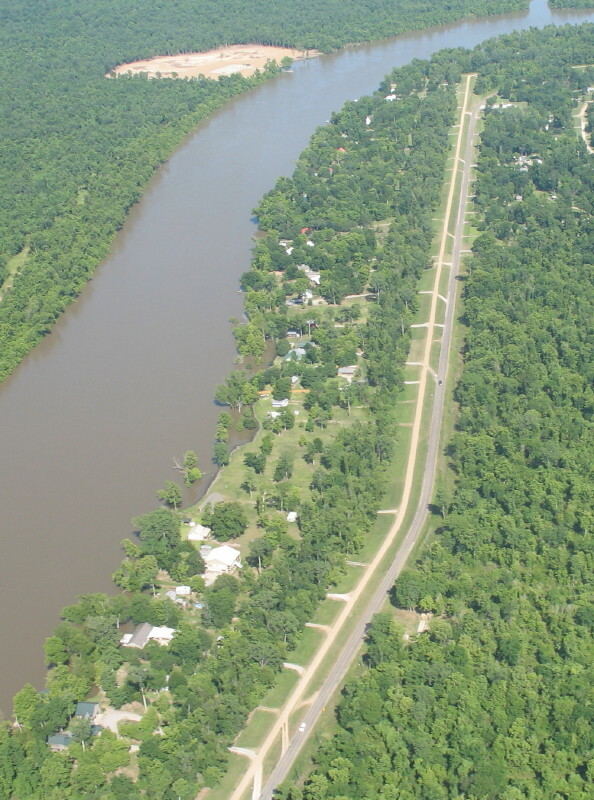 The Atchafalaya just didn’t get to the levels that it would have taken to do serious damage on a wide scale. Some houses got flooded, to be sure, but those are mostly on an elevation not much different from the forest floor. The river bank didn’t flood. At 29 feet it would have gone over the bank for the first time in recorded history, I believe, but not at 23.5 feet. Perhaps some places on the river got flooded in 1973 when the crest was 27 feet, but not many. Anyway, here are a few pics to show basically that Butte La Rose was not seriously impacted by the high water of 2011. The view along the levee shows the extent of the water relative to the houses on the high river bank. It didn’t reach them. Some docks got flooded, and maybe a few other structures that were down near the water. Our house is right in the middle of one of the pics. 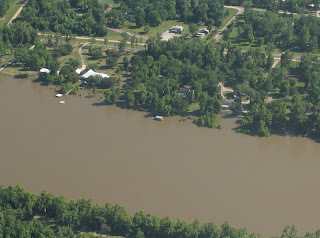 There is a rectangular floating dock out in the river, and our house is behind it, basically covered by trees. I never realized that we had the most forested property along the river in our area. Our house is barely visible. Another picture shows the Butte La Rose boat landing, near the general store. It too was not flooded out. The water came pretty much to the top of it, but that’s all. 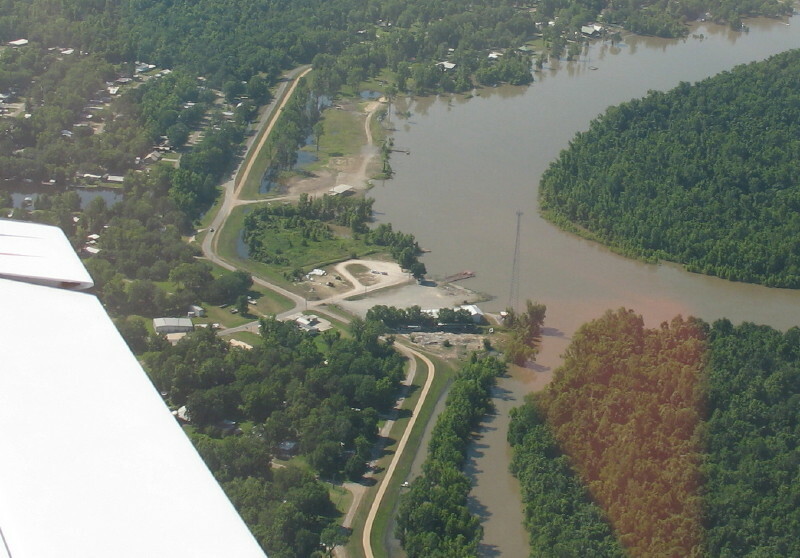 In the middle background of that picture you can see water between the river and the levee top. That water is covering the driveways of several people who cannot return home yet. The houses are fine, except for the driveways. One picture shows the so-called pontoon bridge at the far end of the Butte La Rose road, as some call it (Herman Dupuis Road, to others). The bridge was held open for the last couple weeks but is scheduled to become passable again in the next few days. No flooding is apparent in this area either, but farther up this road is where some houses did take on water. And that’s about the extent of it. Everyone was well warned that there was potential for very serious consequences and Butte La Rose was about as ready for it as a community can be. But, we are happy that this was an adventure we did not need to have. The river is at 21.4 feet on the Butte La Rose gauge, falling to 20.5 feet by June 8, and falling more thereafter. I saw a lot of sacks of crawfish piled in front of a wholesaler today. Perhaps we will get a late season this year. Hip, hip, hurray for being home again! Thanks for the great update, Jim! It is nice to know that at least some folks escaped what could have been serious flooding. I love the FAA comment on the "amateur" builder. So happy for you - and what wonderful photos. Thanks for the update, Jim! I'm so relieved to learn that your house didn't get flooded! Hi. Thanks to all of you for the comments. It is good to be here amongst a mountain of boxes instead of walls full of mold. Happy to have you as an "accidental" reader. Best of luck to you. How can I get in touch with you regarding a project that I am working on?